Oh my, it is hot. How hot? Well, I have been told it will reach 100 F. today (38C!) I am positive that right now my kitchen is pushing 125 F. Now, for those of you who do not know me, I am not a hot-weather person. My idea of a dream existence is to own a lovely stone house in the south of France and live there year-round except in the summer, when I would head north. I don’t even mind rain from time to time. It’s the reverse of the natural order of things, I know, but my DNA is just not programmed to sustain the heat. I have come to expect the usual summer hot spells, but lately I have been lulled into ignorant bliss by a long stretch of clear, cool, breezy autumn-like weather. I’ve been smiling ear to ear like a fleece-clad cheshire cat, enjoying wind blown hikes with rosy cheeks and watering eyes, while back home, I read sympathetically about the heat in further-flung-regions. So, just when I begin to believe that this will be the summer norm, I find myself facing triple digit temperatures. I suspiciously wonder if the high heat has been lurking and gleefully rubbing it’s sweaty hands all along, plotting and waiting to pounce as soon as I let my guard down. Well I can roll with the punches. I am now unpacking my small hot weather clothing that I have just packed for a trip to a hot futher-flung-region. I am hiking only at the crack of dawn, and any water related locales have become the preferred destination. And, for sure, the oven is off limits in the house, while all food I prepare comes from my repertoire of recipes that I turn to in extreme heat. One such recipe is my version of gazpacho, a puréed tomato-based soup from Spain, served cold. I call it a liquid salad, because, if you glance at the ingredients, that is very much what it is. My version involves no puréeing, because I love the toothsome texture of the diced vegetables, fresh and satisfying to the bite. 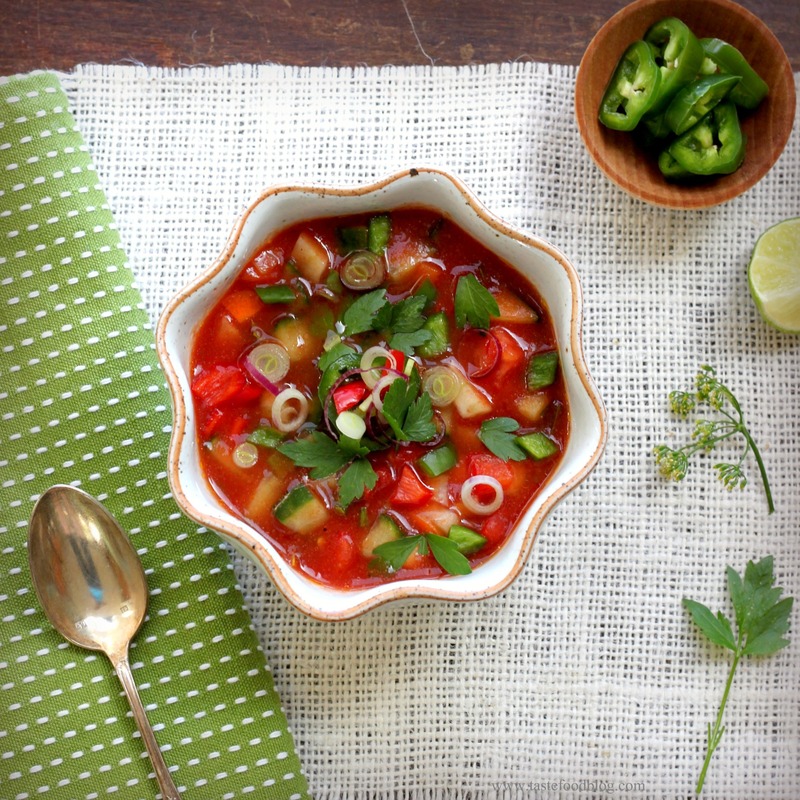 Their colors mingle with their natural juices in a cool, thirst-quenching soup of tomato, making this a festive and refreshing dish to present – one of the few un-wilted looking items in my kitchen at the moment. The selection of vegetables can be varied. I stray from the conventional gazpacho and add carrot for its color and sweetness and fennel bulb for its anise flavor and crunch. This is a perfect liquid salad for a hot summer day. Combine all of the ingredients except cilantro in a large bowl. Adjust seasoning to taste. Cover and chill at least one hour before serving. (Can be made up to 6 hours in advance.) Stir in cilantro before serving. Garnish with cilantro or parsley leaves. Serving suggestions: Top gazpacho with diced avocado and serve with tortilla chips. My father made this last night. I never had a really chunky, crunchy gazpacho before. It was great. I’m going to make this at home. Thanks! You’re welcome, Theresa. I am so glad you liked it!